Join the gut revolution! Experience the life-changing benefits and transform your body, mind and health with the four week gut makeover. The great news is there is a lot you can do to cultivate a healthy gut. 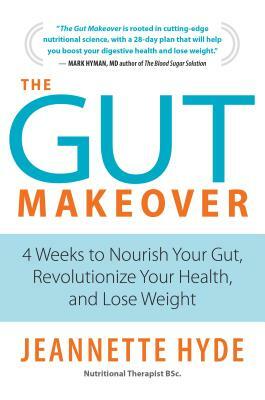 The Gut Makeover is the only book you’ll need to control your weight, improve your skin, lift your spirits and strengthen your immune system--for good. This is more than another fad diet. This is a lifestyle you’ll want to adopt for life. Jeannette Hyde is a leading registered nutritional therapist who runs a private practice in central London, working with clients on gut-related issues to improve well-being. Backed up by the latest in scientific research, Jeannette is at the forefront of her field in developing an accessible way to rebuild the microbiome, the bacteria living in the human gut--which is the key to every single aspect of our health.